The US says it is cancelling free-trade negotiations with Ecuador, after the South American country seized the assets of a US oil company. Ecuadorean oil officials cancelled Occidental Petroleum's operating contract after a long-running dispute. The US administration said it was "disappointed" with the decision. Bolivia recently declared it was nationalising foreign energy companies, but Ecuador says other foreign energy companies have nothing to fear. It insists the dispute is specific to Occidental, which it says violated the terms of its operating contract by selling part of an Ecuadorean field to Canada's EnCana in 2000 without Ecuador's approval. On Monday, the Quito government cancelled Occidental's contract, and the following day officials from Ecuador's state-owned oil company Petroecuador began to take over offices and installations run by the company. Ecuadorean President Alfredo Palacio has sent troops to guard oil facilities seized from Occidental as they are transferred to state control, news agency AP quoted officials as saying. 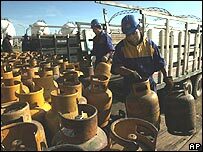 Officials say they are considering teaming up with another South American state-owned company to operate the fields formerly run by Occidental, which produce a fifth of Ecuador's oil output. "We are very disappointed at the decision of Ecuador, which appears to constitute a seizure of assets of a US company," said Neena Moorjani, a spokeswoman for the US Trade Representative's office, in a statement. "At this time no further [free-trade agreement] discussions are scheduled." She said countries must "obey the rule of law with respect to foreign investors" if they hoped to be a free-trade partner of the US, adding she expected Ecuador to pay Occidental compensation. In response, Ecuador's government spokesman Enrique Proano, said his country "laments the declaration by the United States", and questioned the fact that "a sovereign decision by Ecuador" should affect trade negotiations. Before the US announcement, Ecuador's interior minister said any US move to suspend the trade talks would amount to "blackmail". Occidental had been pumping 100,000 barrels a day from wells in the Amazon jungle, which it said represented 7% of the company's worldwide production. In a statement the company said it was "evaluating its legal options to defend its interests", but expressed hope that an "amicable settlement" could be reached. It had previously offered the Ecuador government up to $1bn (£569m) in disputed taxes, investments and extra revenues to end the dispute, while denying wrongdoing. 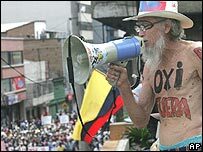 The takeover of Occidental was welcomed by indigenous groups in Ecuador, who had campaigned for the company to be expelled. They were also at the heart of protests in March against free-trade negotiations with the US, which saw a state of emergency declared in five provinces. The US has already reached such bilateral agreements with Peru and Colombia, but some Latin American campaigners say they do not benefit ordinary workers. Separately, both Bolivia and Venezuela have this month announced measures to increase revenue from foreign energy companies operating within their borders.